SO…. 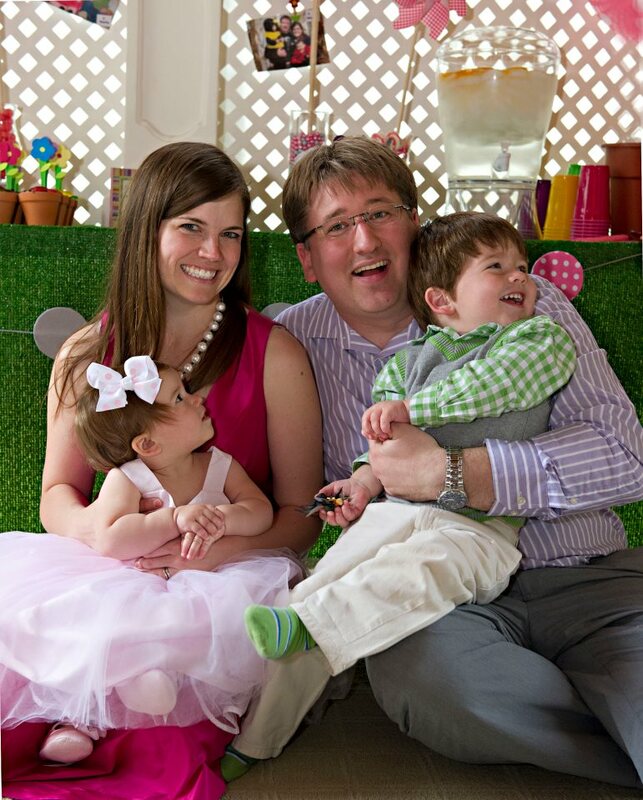 My cousins are going to have a BABY GIRL!!!! I cannot wait! I am beyond excited to hold this little bundle of JOY!! We have a close family, so when there is a new member joining, we get VERY excited!! Of course we were going to have a baby shower for the new member of our family, just deciding when and what the theme would be were the questions. My aunt, the party guru, was in charge of the party! You may remember the Waffle Themed Graduation Party she threw for my cousin’s graduation. That is just one of many unbelievable parties she’s thrown. The theme that she came up with was “Party at my Crib”. 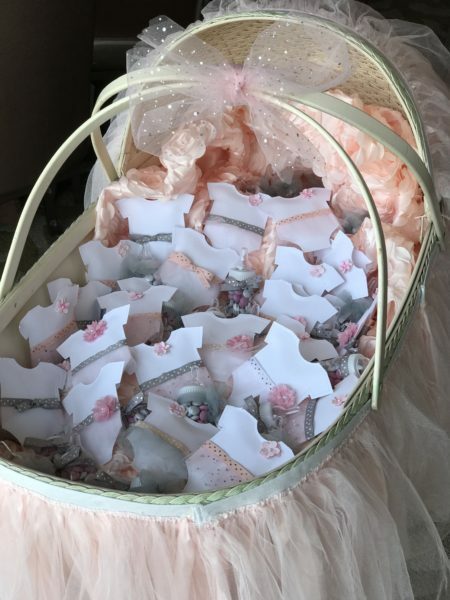 So when we were throwing ideas around, I reminded her about the Baby Shower Bowtie Onesie Favors I made for our friends’ shower. I thought I could just make them into a girl version with a tutu skirt! She loved the idea! As guests were leaving the women who attended the shower got the Tutu onesies filled with personalized M&M’s and the men got baby bottles with personalized M&M’s…to be honest, we did it this way to save on time making a onesie for every person but also because we didn’t think the men would want to be carrying out a tutu onesie, lol! One thing I really liked that we did was make all the onesies unique. We had a bunch of different ribbon, tulle, and flowers to work with. Each onesie had its own personality. I am not going to lie, these M&M tutu onesies took a looooong time to make and are tedious. If you like doing this type of think then it’s not really work, but it still takes a while to make. Luckily I had great helpers!! Even Great Nana pitched in and helped! She counted all the M&M’s (approx. 20 in each onesie). My cousin, mom, and aunt helped make the tutus. My aunt tied all the bow on the back of the onesies! I cut and sewed all the onesies. It was a group effort! 4. To make the tutu: Place ribbon down and add hot glue to the ribbon. Fold tulle over the hot glue. Be sure to be careful on this part because you can burn your fingers easily! 5. 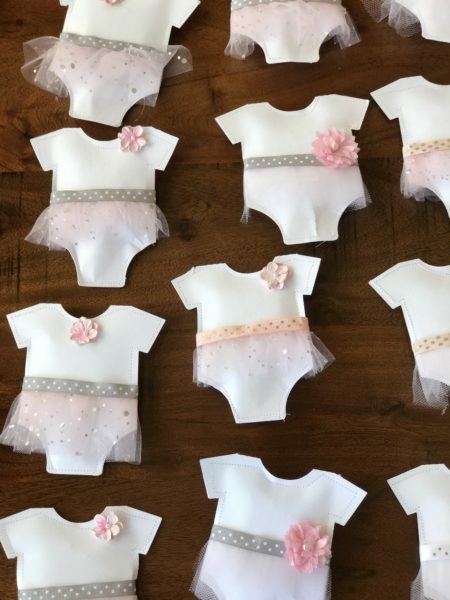 Place tutus around onesies and tie in back. What are your favorite favors to give at parties? 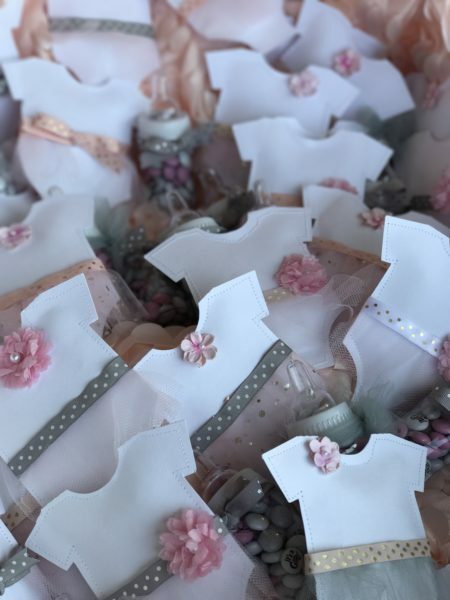 This entry was posted in Parties and tagged baby shower favor, girl shower favor, onesie favor, party at my crib baby shower.